Running a successful remote team is downright hard work, and anyone who says it’s not probably hasn’t done it. It’s hard to juggle all the projects, keep the clients happy, and continually make sure the priorities are right. Over the past ten years, I’ve learned a lot about how to manage a remote team and what it takes to grow a team that is built on trust, accountability, and most importantly results. Here are three of the lessons I’ve learned the hard way. The following is an excerpt from “No Excuses: The Definitive Guide to Building a Remote Team” which is available free from Hubstaff. It’s difficult enough to manage your business when you have honest, hard-working people on your team. But when a team member drags you down, you’ve got to learn to end the relationship sooner rather than later. I know it’s hard… It’s hard because you’ve invested a lot of time and effort into training. It’s hard because it means more work for you. It’s hard because you’ve developed a personal relationship with them and you care about them. But what you have to realize is that it’s very difficult for you to motivate or make your team care more than they do at this very moment. Some people just don’t care… they don’t have the same drive as you, and they just want to collect a check and move on. The sooner this becomes your reality, the sooner you can start to move forward and make changes in your business. It will become clear that it’s not your fault this employee is not motivated and furthermore, it’s not your job to motivate them. So what’s the solution? Well, you start by putting more time into the hiring process and finding self-motivated people. Just as some people are not motivated (and it’s my belief that you’re going to have a very hard time trying to motivate them), some people are fully self-motivated. These are the people you want seek out and add to your team. They are the ones that will become accountable for their own actions and projects. They are the ones that don’t rely on excuses and are willing to transfer load from your shoulders to theirs. These are the people you need to start hiring. The first step is to take it upon yourself to not spend so much time and effort trying to change who someone is. Instead, spend your valuable time finding their replacement. Just try to find someone who fits the mold of your ideal employee better. It’s much easier, less stressful and a better move in the long run. As we’ve just covered, self-motivated people are key to building a better virtual team. Here’s how you can tell if someone is self motivated in only a few hours. Start by firing up your to-do list, and I know you have a long list… Find a task in the general category of the person that you are looking to bring on. For example, if you are looking for a web designer, your selected task could be redoing your logo, designing a website header, or developing a new HTML email template. Now put together a brief job description around that task. You want to be specific, but also remember, your goal here is twofold. You’ve got to find someone with skills but also someone who is self-motivated. Put this job description up on your favorite freelancer site or job board, and watch the leads funnel in. The next step is to make these potential hires compete for your position. Ask them to develop some ideas around the task. Ask them to develop a very short plan and present it to you and always require previous samples. At this stage you are looking for communication skills, speed, and skill. You’re looking for someone that will add value to your team, not just someone who does as they are told. Once you have your favorite two or three people, then hire them. Yes, you actually hire multiple people for the exact same task. See what it’s like working with them in a test setting before you start relying on them too heavily in your business. Sure, you are going to pay an extra few dollars by doing this, but the long-term benefit is huge. You’re going to get two or three versions of this task. You’re going to experience first-hand the work of these people, and you’re going to learn if they are someone that will benefit your team long term. If you find someone that is really good and delivers a quality product then you start slowly integrating them into your larger projects. You can do this with web design, content writers, video producers, programmers, link builders, PR firms, or any other function your business needs. Over time, you’ll build trusted relationships with multiple providers that have very specific knowledge and you’ll be developing a great asset along the way. Imagine having a team of trusted contractors that you can pay by the hour in any function of business you can think of. That’s where we are going. 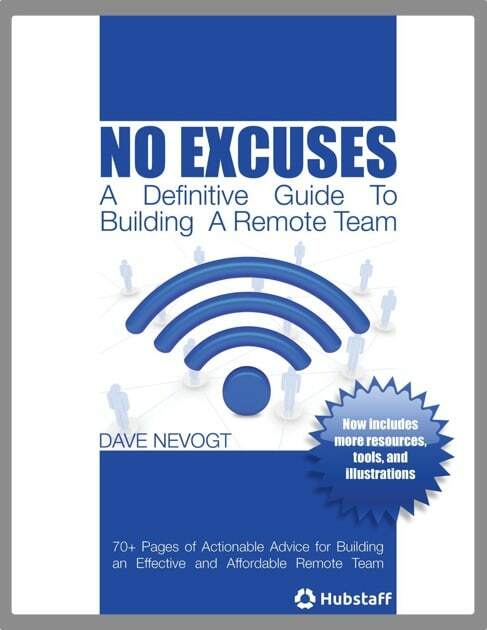 Resource: Here’s a 70+ page book “No Excuses: The Definitive Guide to Building a Remote Team” that is available for download on the Hubstaff blog. It’s completely free and goes into great detail on hiring, job descriptions, test tasks and more. This simply means that you have more than one person that understands how to get the job done. You’ve got multiple people that can run your help desk, multiple people that know your code base, and multiple people that can bring leads into your business. First, because employees and contractors leave, and you’ve got to be prepared. Your business is a fluid entity. You’re always trying to improve it, and you’re always making adjustments. When a contractor leaves, assuming you’ve stuck to this principle, you’ve got someone in waiting that can pick up the workload. It’s also good when one person goes on vacation, loses an internet connection or similar. It’s just not as big of a deal when you have another trained person that can step in. Secondly, when you have multiple people that know how to do the same task, it tends to make each of them step up their individual results. They understand that they’re not the only game in town. They know there’s another option. It creates competition and in general, this is a very good thing. Finally, it creates an environment of teamwork. Employee A has ideas that employee B does not, and visa versa. This allows your team to select the best ideas, and not be locked into one way of doing things. This also leads to higher job satisfaction on your team. As you continue building your team, keep these three lessons in mind, and my hope is that they get your mind thinking in some different directions. What are the methods that you use to manage your team? I’d love to hear about them below if you have a few seconds to spare. Hubstaff makes managing remote teams easy. Try it free for 14 days.